Though Sir Joshua Reynolds was to say of his rival and sometimes-friend Thomas Gainsborough, a co-founder with him of the Royal Academy, that “his passion for his art was much greater than his love of either fame or money,” the reality, perhaps, may not bear this out. Money was a major driving factor in the life of Gainsborough. Although he was a prolific painter, he was never to achieve Reynolds’ great wealth. In fact, no two artists could have been so unlike. And so unlike the third painter I’ve chosen to discuss, one of their greatest rivals, George Romney. Gainsborough’s background was more modest than Reynolds. His family was not learned, not by any means. The son of a Suffolk weaver, there were no artists in his family, much less were there clerics and academics, as in Reynolds’s family. The boy, however, showed some talent for drawing at an early age that was recognized by his father, and so he was sent to London around 1740 to study under the engraver Hubert Gravelot and the painter William Hogarth. An interesting fact about him was that he was one of those rare artists who never left England to study abroad. Unlike his contemporaries, most of the better known artists of his day -- Reynolds, Romney, Ramsay, and that ilk – as well as decidedly lesser painters -- he was an anomaly in that he did not study in Italy, nor, apparently, did he care to do so. Margaret Burr, Gainsborough’s wife, painted probably in her early middle age, circa 1758. This is one of several portraits of her painted by her husband. She actually met him as a young woman whilst sitting for her portrait. He married Margaret Burr in 1746. She was an illegitimate daughter of the Duke of Beaufort, and was said to have openly and freely boasted of the relationship to anyone she met. As a dowry, the Duke settled an annuity of either £200 or £400 upon her. 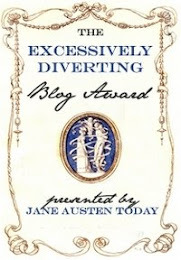 (Sources differ as to the exact amount, but neither were paltry sums; multiply by at least 70 times for current value.) Her annuity no doubt was part of the attraction for Gainsborough, and it was unfortunately the focus of many a marital argument, as he kept borrowing against it to her dismay. What happened to that portrait Gainsborough painted of Margaret Burr when he supposedly fell in love with her? There’s a portrait of a lovely young woman by his hand at the Hermitage Museum in St. Petersburg called The Lady In Blue, with no other attribution. Could this be it? Is this Margaret Burr as a young woman? 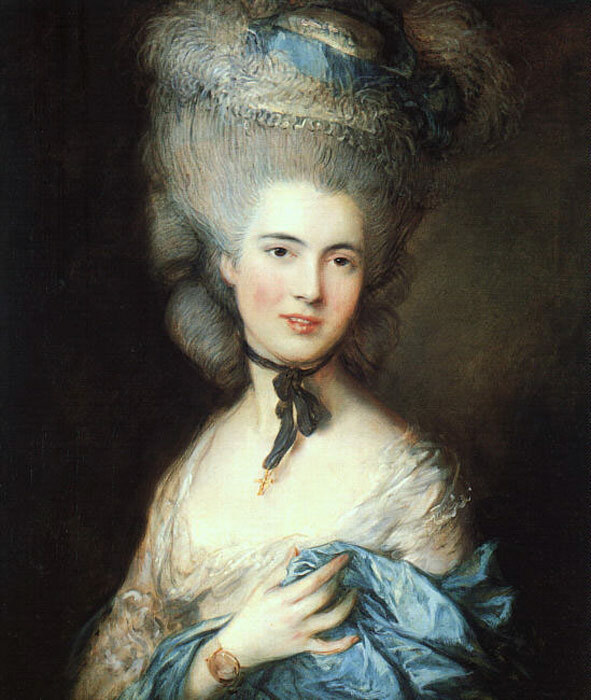 Viewers have had mixed opinions as to whether this is Margaret Burr, as mixed as most opinions that exist about the lady. I think there’s a resemblance in the hairline -- a slight widow’s peak – and perhaps in the name The Lady In Blue, harkening, perhaps, to his The Blue Boy, arguably his most well-known painting? The Blue Boy, painted in 1770, when the Gainsboroughs lived in Bath, is not the portrait of an aristocrat’s child. His name was Jonathan Buttall and his father was a hardware merchant and a friend of Gainsborough’s. The style is an homage to the Flemish artist Van Dyck, who worked in England and appeared to have been a sort of patron saint to some 18th-century portraitists, Gainsborough in particular. In Bath, he painted what I think are probably his most exquisite portraits, that of the Linley children, two of the daughters and one of the sons of a musician friend of his. The girls were also fine musicians, the elder, Elizabeth, a vastly talented singer who married the playwright Sheridan. (Who forbade her to sing in public after their marriage, but that is another story.) Gainsborough also painted an enchanting portrait of Elizabeth alone and of Elizabeth and Thomas. (Thomas, a violinist and as well as a very talented composer, was called The English Mozart.). 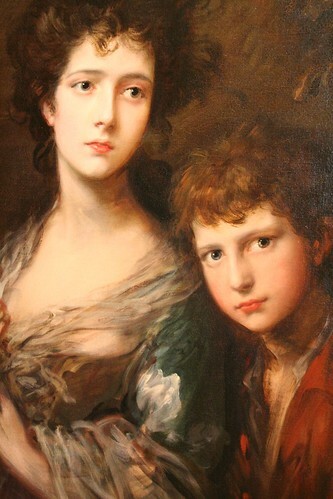 This portraits of the Linleys are, in my opinion, the best portraits executed by the hand of Gainsborough. There is a poignancy in them that perhaps foreshadows the tragic end of these beautiful young people; Thomas drowned in a boating accident; the girls all succumbed to consumption. The family had grown. 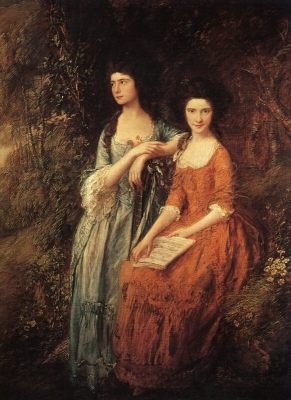 In addition to his nephew Dupont, the Gainsboroughs had two daughters, Mary and Margaret. (Their first daughter, also named Mary, had died as an infant.) Gainsborough painted several portraits of his daughters, to whom he was very much attached. Like Reynolds, he had a sweet touch with children. In London, Gainsborough charged higher fees and made more money, but he seemed not to be so happy in his work. And, indeed, he made a radical change years later, leaving portraiture for landscapes. (The last exhibition of Gainsborough’s work, at the Tate Britain, was an eye-opener for those who thought he only painted portraits. His landscapes are stunning and among his best work.) And his wife Margaret Burr must have been happy: no beautiful women, only trees, bushes, hills, streams, horses and cows… But, back to his portrait-painting days. Harsh and cynical words, indeed, and it’s difficult to imagine Sir Joshua Reynolds saying this to anyone, much less writing it down. To me, it explains why I find so many of Gainsborough’s portraits cold, despite his very great skill with his brush. (Trivia: one of his favorite paintbrushes was six feet long, but I digress…) If he considered his work to be merely financial transactions, something has to be missing. Having said that, what portraits do indeed pop out with warmth, and, yes, passion? There are some, even of society women, that do, but by far the greatest warmth is, in my opinion, reserved for the women outside the pale, the courtesans so beloved by Reynolds. Gainsborough’s first portrait of Grace Dalrymple Elliott, a la Van Dyck – could the lady’s cleavage be any lower? – the face is not well executed (see second portrait), circa 1778. 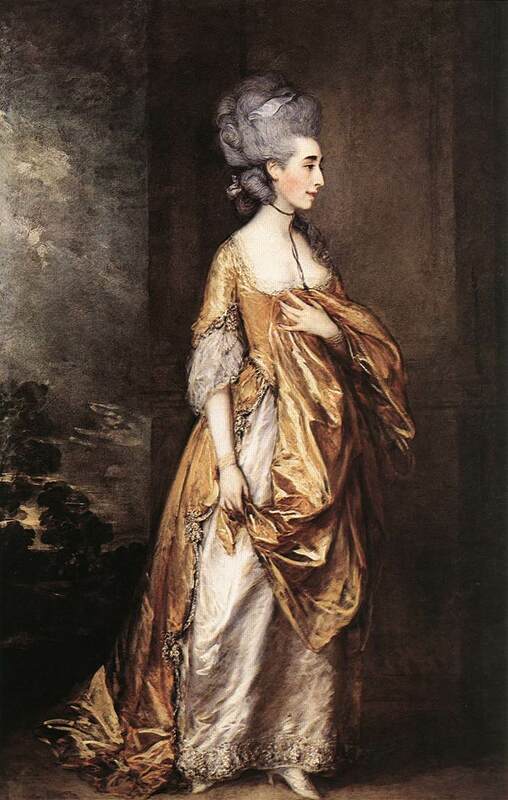 Consider Gainsborough’s second portrait of Grace Dalrymple Elliott, the subject of my biography My Lady Scandalous. Gainsborough had painted her previously, in a style akin to the great Van Dyke, a full-length portrait in a shimmering yellow silk gown. It’s beautiful, but cold, and Mrs. Elliott, save for her remarkable cleavage, is simply a clothes-horse. Little attention is paid to her face This second portrait, however, is striking, and zeroed in on the stunning woman herself. A portrait-bust, it draws the viewer in, the dark, wide-open eyes and the slightly parted lips surely issuing a subliminal invitation. Gainsborough was, in fact, criticized at the time for this very portrait, told in strong terms that he’d made his subject much too alluring for her kind of woman. Gainsborough was undoubtedly attracted to her this second time around. (There were, by the way, sketches for a third portrait that was never executed; these can be seen at the library of the National Portrait Gallery.) He was said to have been sexually aroused by the more beautiful of his sitters, so how much more would he have been aroused with a sitter who oozed sensuality and easy virtue? Gossip had it that he would hie himself off to Covent Garden after a particularly stimulating sitting to consort with prostitutes. This habit once gave him a powerful dose of gonorrhea that nearly killed him (some newspapers actually reported he’d died). But, affairs with his sitters? 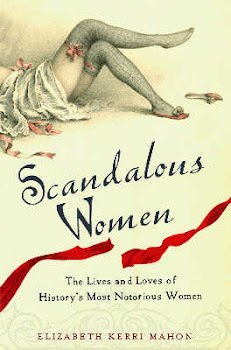 Although his very jealous wife Margaret thought the worst of him – and was probably right -- he most likely gave his custom to prostitutes rather than risk his professional reputation by hitting on his sitters. It is not difficult to believe, however, judging from his most sensual portraits – such as the second one of Mrs. Elliott (above) – that his sitters did not arouse him to some extent. The difference in how he painted her from the first portrait to the second speaks volumes. Self-portrait,1787. 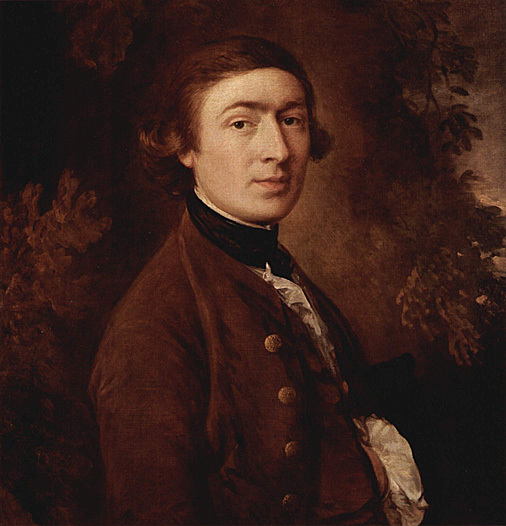 Gainsborough was dead a year later, having succumbed to cancer at the age of 61. And, in truth, painting Margaret Burr’s portrait as a young woman probably aroused him a bit, too. He did marry her! A young and possibly attractive female, the illegitimate offspring of a duke…that more than whiff of scandal…that had to have gotten his blood up. The annuity…ah, icing on the cake for a poor but ambitious young painter…but it would surprise me if he had not been truly sexually attracted to her in the beginning. On his deathbed in June of 1788, Gainsborough asked to see Reynolds and the two great English painters reconciled their artistic differences. That year, Reynolds made Gainsborough the subject of one of his Discourses, the 14th, the only one of his contemporary peers to whom he gave this singular honor. Despite their differences, they had very much more in common when it came to their art and they, as Graham-Dixon put it, “Almost single-handedly, Reynolds raised the status of the painter in Britain from craftsman to artist.” He adds, “Before Reynolds, painters used the tradesmen’s entrance. 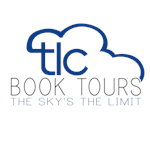 After him they were allowed …through the front door.” An exaggeration? Perhaps, but the same could be said of Gainsborough. They both elevated the painterly arts. The Gainsboroughs are buried at Kew. It’s a wonderful old neo-classical church built in 1714, during the reign of Queen Anne. The Number 65 bus passes it and you can see the lovely Green, on the way to Kew Gardens and the National Archives at Kew. The miniaturist painters George Engleheart and George Meyer and the portraitist Johan Zoffany are also buried in St. Anne’s Churchyard. Ah, can you but imagine what conversations on art and life must take place at the witching hour! An incredibily informative post, thanks for sharing all of the beautiful portaits as well. 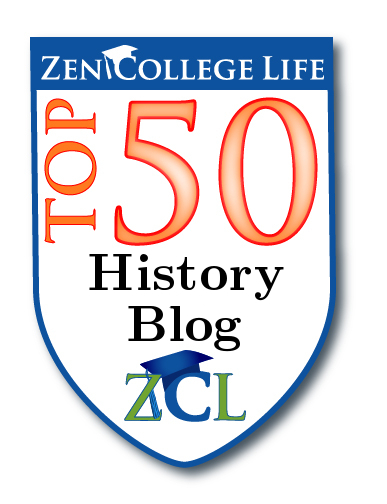 Wonderfully informative and great visuals! Gainsborough's House in Suffolk (Sudbury) is one of my favourite places to visit. The collection includes some lovely portraits of his children as well as some charming and detailed studies of the local landscape. His aristocratic portraits are very fine, but the domestic portraits have a very particular charm that I almost prefer. But in truth I like his entire oeuvre. Thankyou for an entertaining review, knew very little before, at least I know something about him now!